Maxillary impacted canines represent a common and challenging clinical situation. Fixed orthodontic treatment has been largely utilized but with the drawbacks of a prolonged treatment time and the possibility of intrusion of the adjacent teeth. Both of this inconvenience can be overcome through means of a skeletal anchorage. The aim of this study was to evaluate the effectiveness of a new method for the management of buccally or labially impacted canines, with a new absolute anchorage mini-screw: five patients with a mean age of 18.5 years and with a total of six maxillary impacted canines were recruited. The mini-screw was placed palatally and a spring made of 0.019 x 0.025 Titanium Molybdenum Alloy (TMA) was used to apply the traction force. Results: All six impacted canines were successfully recovered. The mean duration of forced eruption was 6 months. Conclusion: Mini screws with surface treatment allowed the required osseointegration, in applying the system forces suitable to canine disimpaction, using as exclusive anchor a single microscrew, in order to eliminate the side effects on natural dentition. Maxillary impacted canines can be considered a complex problem that often occurs in clinical practice. Canine is the second most frequently ectopic tooth in the dental arch after the third molar  and affected about 2% of the population . Its prevalence varies from 0.9% to 2.2% in the general population [2,3] or even 2.4% in Italian population . According to Ericson and Kurol 85% of these teeth being situated on the palatal side of dental arch while 15% on the buccal one . It is more common in female than in male and has a definite tendency toward being unilateral rather than bilateral [2,4,5]. Its multi-factorial aetiology is mainly represented by local factors such as: a prolonged presence or early loss of deciduous canine, a tooth size-arch length discrepancy [5,6] or a reduced root length of permanent lateral incisors [7,8]. However, hereditary factors play a role in its etiology as well [9-11]. Treatment of impacted canine need for an interdisciplinary approach, that includes a combination of surgical exposition of the impacted tooth, at first, and then of orthodontic adequate biomechanics for repositioning into its place in the arch, respecting periodontal tissue. As reported in literature, the conventional treatment protocol requires the opening of space for an impacted maxillary canine with a fixed appliance and surgical exposure of the buried tooth to bond a button with a silver chain extending through the surgical flap. Then, a light traction force, generated by an elastic thread, had been attached from the silver chain to the fixed orthodontic appliances in the appropriate direction to solve the impaction [6-9]. This traditional procedure is usually associated with intrusion of the anchorage unit, based on the law of action and reaction. In order to overcome this limitation and provide an absolute anchorage for tooth movement was introduced Skeletal anchorage, using miniscrews, known as TAD (Temporary Anchorage Devices). Some cases report used a microimplant to move into its ideal position a palatally impacted maxillary canine, however fixed appliance was simultaneously placed in the upper arch [10,11]. The aim of this pilot study is to evaluate the effectiveness of a new method for the management of buccally or labially impacted canines, with a new absolute mini-implant with a bracket-shaped head for achieving absolute anchorage during the extrusion of a palatally or labially maxillary impacted canine. This procedure did not require fixed orthodontic devices, excepting for final alignment of the impacted canine, in order to minimize iatrogenic root resorption of the maxillary lateral incisors, which is caused by a direct root contact between teeth during the active relocating procedure. For this pilot study, we selected 5 patients with impacted canines. Their mean age was years 18.5 (17.2 to 21.3 years). Three of them had one upper canine retained palatally, one of them had one upper canine impacted buccally and one patient had both upper canines impacted palatally. None of them had previous orthodontic treatment or active periodontal disease in the beginning of treatment. All patients, undergoing antibiotic prophylactic therapy for 5 days were treated in the third day; after local anesthesia with articaine, was inserted in palatal position a self-tapping micro-screw 2.5 mm diameter and 8 mm length with surface treatment by blasting with alumina and acid etching and with the head in the shape of orthodontic brackets with slot 0.020 x 0.025 (Intra-Lock International® Boca Raton, FL, USA). The surgical protocol, according to company guidelines, has required a partial osteotomy with a single 1.2 mm drill for a third of implant length. The micro-screws were inserted using the patented Drive-Lock driver (Intra-Lock International® Boca Raton, FL, USA) with a torque wrench to check that the tightening torque does not exceed 50 Newton. In the same surgical procedure the impacted canine was exposed with its application of an orthodontic bracket with a metal chain on the coronal surface exposed, then suture. The suture was removed seven days after surgery. The mini screws were loaded 6 weeks after surgery applying for the canine traction a spring made of 0.019 x 0.025 inch Titanium Molybdenum Alloy (TMA) wire. During the clinical revaluation every 4 weeks, the TMA was re-activated or replaced to obtain the correct positioning of the canines both in the vertical and in the buccal lingual sense. Finishing was done with fixed orthodontic device. The mini screws were removed at the end of the therapy while the containment was performed with fixed retainers in triflex 0.0195. The mean treatment duration was been 6 months ranged from 4 to 8 months. To follow will be presented a clinical case in proposing the treatment step. The maxillary impacted canines were successfully recovery in all 5 patients according to their clinical needs. Finishing was done with fixed orthodontic devices (Figures 1-7). Figure 1: Panoramic radiograph before treatment showing the presence of bilateral maxillary impacted canines. Figure 2: Intraoral view before treatment showing the persistence of both maxillary deciduous canines. Figure 3: Immediately after the surgical intervention: insertion of the mini-screw, impacted canines exposure, attachment of a bracket on their surface, suturing, and application of a double arm wire 0.19 x 0.25 in TMA alloy. Figure 4: Application of extrusion force and activation of the double arm wire every four weeks. 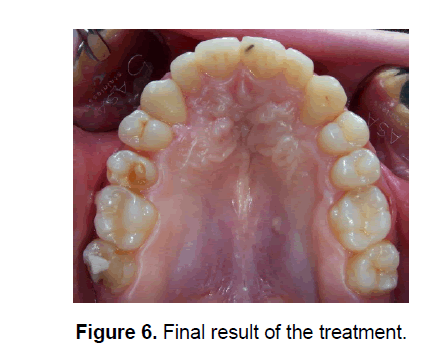 Figure 5: A partial fixed orthodontic appliance was used after the extrusion of impacted canines. Bracket were placed only on teeth 16 and 26. Figure 6: Final result of the treatment. Figure 7: The patient did not receive any treatment at the lower arch. When left untreated, impacted maxillary canines can lead to serious complications including a possible resorption of the root of the adjacent lateral incisors or an infection associated with its partial eruption . A multidisciplinary approach involving a fixed orthodontic appliance and a surgical exposure of the impacted canine, has been the treatment of choice for many years. With a variety of options in terms of orthodontic mechanics and surgical approaches [13,14], this treatment has produced successful and stable results. Nevertheless, this standard protocol has some shortcomings that need to be ad- dressed. First, it inevitably requires the application of a fixed orthodontic appliance prior to the extrusion of the impacted canine, even when there is no need for space creation. Moreover, the reaction force during extrusion is distributed on the adjacent teeth which serve as anchorage units, possibly causing their intrusion or displacement . Therefore, a highly skilled orthodontist is required to manage the complex mechanics and a light force of extrusion needs to be applied leading to a prolonged treatment time. Furthermore, ankylosis is a commonly encountered situation among impacted teeth which cannot always be diagnosed through a clinical and radiological examination . In contrast to traditional methods we used in all critical step only a mini screw as absolute anchorage [17-19]. In this way, there were no undesirable effects on the natural dentition during canine extrusion. The mini screw choice with surface treatment by blasting with alumina and acid etching was preferred in obtaining a larger osteo-integration compared to fibro-integration the same, given the complexity of the force systems often required for proper repositioning of the canines. This allowed foreseeing the application of a single micro-screw palatal in disimpaction cases of upper arch canines. The head-shaped bracket allowed the use of micro-screw for pulling a wire in TMA 019X025 adequately modeled, which for its characteristics of elasticity allows to apply lighter and more continuous force contrasting to elastic materials used for force delivery used in some studies . The prophylactic antibiotic therapy were prescribed for the unconventional surgical implant site treated basing on evidences that suggest to achieve high long-term survival and success rates of dental implants, antibiotic prophylaxis is required . For this initial pilot study were selected 5 patients with similar anatomical, systemic conditions and similar orthodontic needs, to better investigate on the ideal protocol indications. Becker A, Chaushu S. Etiology of maxillary canine impaction: a review. Am J Orthod Dentofacial Orthop 2015;148:557-567. Darendeliler AM. Treatment of an impacted canine with magnets. J Clin Orthod 1994;28:639643. Surapaneni H, Yalamanchili PS, Basha MH, Potluri S, Elisetti N, Kiran Kumar MV. Antibiotics in dental implants: A review of literature. J Pharm Bioallied Sci. 2016 Oct;8(Suppl 1):S28-S31. Review. PubMed PMID: 27829741; PubMed Central PMCID: PMC5074034.